One of the best ways to add interest to an otherwise boring space is to add some shine. The first thing that usually comes to mind is mirrors but opening up your space and creating a quality design doesn’t always demand it. Not only can metallic pieces make your place look really sick, it can add needed color to neutral themes and even add a sense of luxury. It can be pretty difficult to find designs where silver and gold go this well together. The white marble is just the icing on the cake here! These metallic mosaic tiles are just so artsy looking. I think this would look great in a modern yet simple kitchen. These tiles are enough of a statement on their own! This color pallet makes having a significant amount of shine actually easy on the eyes. This is a very glamorous look for those who don’t want to go way overboard. The warm colored lights go very well with the rest of the cool toned room. If you are into a very modern look, this design could work out very well for you! Being an insane lover of all warm toned metallic, this room is super impressive to me. I have never given much thought to inlays but this design is truly eye opening. 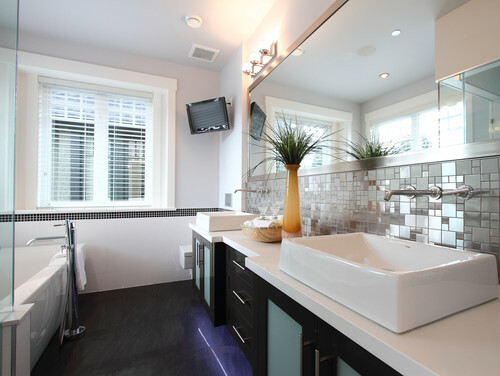 This tiny bathroom ends up looking so grand with this luxurious design. I will definitely keep this in mind if I ever need to fancy up a small room. I could totally see this design in a New York apartment. It’s so hip! This design seems very accessible for people who just want a touch of bling without spending a whole lot of money. The shapes in this design are so interesting to look at! I love it! This one is probably my favorite. If you want that luxurious in your face glam look that you’d find at a Las Vegas hotel, keep this one in mind! Metallic tiles can be incorporated into so many different designs and don’t necessarily have to be super modern. Which design is your favorite?